Bah, still having connection issues. Ah well, gives me an excuse to do a meme! 1. My friends list is very, very small. 2. I spend a good majority of my time in SL out of the game… sometimes I just log in so I can listen to the music stream I set on my land. I know I can listen to it on my computer but for some reason it’s more fun to listen to it through SL. I’m pretty much perpetually afk. 3. I have a serious hair addiction. 4. I haven’t tried to cultivate a look or a persona in SL, I pretty much just wear/look like whatever I felt like that day. 5. 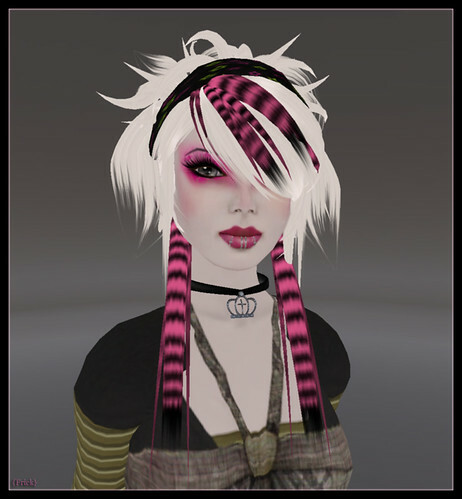 I am as shy in SL as I am in RL. 1. My hair is currently dark pink. 2. I love vintage clothes and hats but am freaked out by vintage shoes. 3. I’m a card carrying member of a fan club. 4. I have two small and very spoiled dogs. 5. I used to be a musician. This entry was posted in Pictures, Random and tagged Curious Kitties, Dutch Touch, Gritty Kitty. Bookmark the permalink. 1. my friends list is bigger than I’d like it to be, since I am shy about bothering people and hope that they don’t mind the silence. 3. I have a serious texture addiction but it seems free hair and skin comes up on that list when I find out about one. Still considering that I could easily learn how to build hair one day. 5. I am as crazy and silly in SL as I am IRL. 1. I just dyed my hair dark black last month- its growing on me. 2. I love vintage stuff- but very very vintage..
4. I have used to have one very wonderful cat. Wow! I don’t meet too many people who also used to be pro musicians! That is so cool! XD I’d love to be able to make hair someday but my attention span for stuff like that is pretty slim. I get frustrated and say screw it just about everytime I set about to building. I blame the SL camera… it makes me crazy. Freaked out by vintage shoes? You mean the style? Or do you mean pre-worn, because yes that would be creepy.